Mark S. Solomon, managing partner of Katten's Dallas office, focuses his highly active mergers and acquisitions practice on representing private equity firms and public and private companies from diverse industries in transactions of all types, sizes and complexities. He also counsels clients on a variety of public and private securities offerings, venture capital, joint ventures and private equity transactions. Regarded as a top dealmaker locally and nationally, The Deal magazine recognized Mark's work as lead counsel in representing a multinational corporation in its $3.5 billion acquisition of a financial services company as its "Deal of the Year." Mark frequently speaks and authors articles on a broad range of corporate and transaction topics. 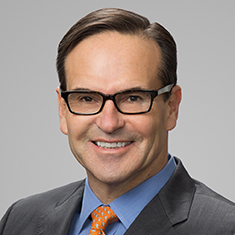 He is consistently recognized by his peers and has been selected to the Texas Super Lawyers in securities and corporate finance and has been recognized as one of the "Best Lawyers in Dallas" in the corporate finance and mergers and acquisitions category in D Magazine.